The arrival of that job title we now call CAO (chief analytics officer) comes with a few other new realities for the ‘next-generation’ IT shop. This next-gen IT Nirvana sees analytics now driven from a top-down perspective (i.e. the boardroom and the central IT function) and, also, successfully disseminated throughout every lower echelon and tier of the company (i.e. every employee is armed with an analytics-aware device) so that every workers’ data streams are captured for the wider data analytics pool and not left redundant in a silo. This, in real terms, is institutionalised analytics — in a good way. Firms will now combine institutionalised analytics with their ecommerce channels to complete the picture (for now) as they bring cloud-based financials and ERP in to direct the normal throughput of corporate information around their business. NetSuite is aiming to form a logically structured and even wider virtuous circle here and create what it calls omnichannel commerce as the new norm. The company recently acquired London-based Venda, a leading provider of ecommerce solutions, to build upon its own NetSuite SuiteCommerce footprint. “By combining Venda’s customer insight and years of experience delivering a real-time, scalable commerce platform with NetSuite’s cloud leadership, we can bring new capabilities to B2B and B2C companies of all sizes and transform how they run their businesses,” said Zach Nelson, NetSuite CEO. Venda’s Convergent Commerce Platform is an ecommerce platform for retailers and brands to use online, mobile, social and in-store. This is institutionalised omnichannel commerce analytics… a term we are perhaps not quite used to yet. NetSuite says it is aiming to enable companies to “re-platform core operational business systems” in the cloud — and work to support the transformation of those core operational business systems to help organisations transform B2B and B2C commerce to support an omnichannel world. … and you thought institutionalised was a bad word? 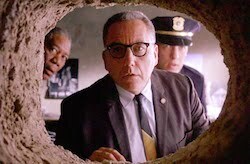 Relax, that’s only if you’re watching the Shawshank Redmemption.